Tokyosphere, like Tokyo, has virtually no limits. In the case of the amazing city itself, which is a vast international stage, the only boundaries are those imposed by reality. In the case of this amazing group, whose stage is international, the only reality is the unbounded musical imagination of John Kaizan Neptune and his multi-talented co-performers. 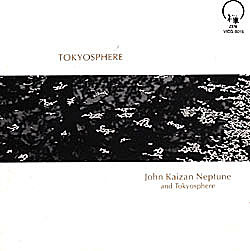 Tokyosphere is the first Neptune group to be forged exclusively of artists who, like Neptune himself, are masters in traditional Japanese instruments. All of the members of Tokyoshere are concert soloists in their own right. All are licensed masters of their instruments-- regular performers on Japanese radio and TV and familiar to many audiences around the world. Among their many credits are various cultural awards and numerous recordings both in the traditional as well as contemporary music fields. Tokyosphere explores a unique spectrum of sound textures that refuses to be categorized. There are Japanese "shibui" moments of mellow, jazz moments with pizzazz, contemporary and traditional flavors with spices improvised from both East and West.